Hustle and Bustle and a Mango Cucumber Smoothie. This has been a whirlwind of a crazy morning…lots of deadlines and such to hit at work. 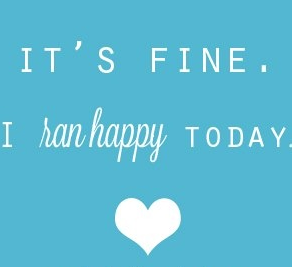 Sometimes you just need the calm of that morning run to get through the hustle and bustle. Can I get an amen? Today I have a post run smoothie for your taste buds! Talk about a party in your mouth. This mango cucumber smoothie will not disappoint. 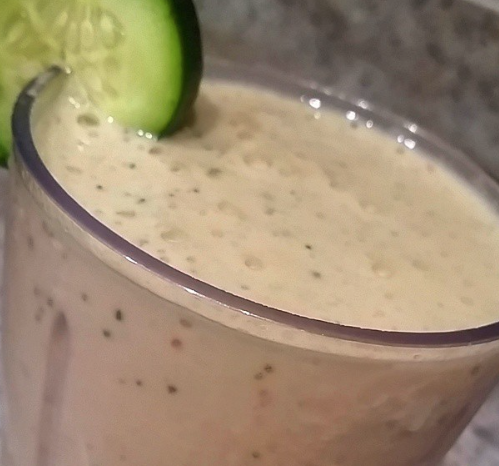 Who knew cucumbers in a smoothie could be so good? Blend and serve! Talk about a delicious runner’s cocktail. What are you whipping up in the kitchen today? This entry was posted in Recipes, Running, Smoothies by thedancingrunner. Bookmark the permalink. If you haven’t tried Silk Unsweetened Cashew Milk…you need to. It’s SO much tastier than almond milk and I love almond milk. Is it now? I’ll try it…thanks! That smoothie sounds pretty tasty. We usually don’t have mango in the house just because the husband is allergic, but I love it! I wonder…could you use mango nectar instead of the actual mango? Or just leave out the mango altogether…strawberries and bananas with cucumber would be good as well! It really reminds me of a fresh cocktail! Enjoy! Nice smoothie creation. I still have not replaced my broken blender, but I really need to. I’m eating left overs. Tuna casserole. mmm love tuna casserole! So good for leftovers too. Looks yum! I definitely need to invest in a Magic Bullet or something now.. haha! Yep! My mom has one…this one’s a Hamilton Beach personal travel blender and I love it! I use it everyday. Ooh I’m not a huge smoothie person but that one sounds great. I LOVE mango! And it actually looks good. Yum! Womp womp, more for me! Thanks Melissa!! hahaha cukes…I love it. Yes it’s good.